Kristen Christian, 27, born and raised in Arroyo Grande, invited her Facebook friends to close their accounts at big banks and move their money to credit unions by Nov. 5. About a dozen protesters wanting to take power away from the ultra rich and give it back to the people picketed at the Atascadero Citibank on Saturday. They contend that credit unions bring money back to the community, KSBY said. Rod Brown, CEO of the California Bankers Association, argues that traditional banks invest much more into local communities while paying federal taxes. What is considered a large Bank? Santa Barbara Bank & Trust has since 2007 been overcharging the Oceano Nursery SBA loan monthly payment after requiring the Inverse condemnation lawsuit of Oceano Nursery! Most people do not even have a clue that it was Santa Barbara Bank & Trust that caused the closure of Oceano Nursery! Why would a local Bank require a SBA Loan costomer to Fight Inverse Condemnation? Why would a local Bank like Santa Barbara Bank & Trust as seen at http://www.sbbtfraud.com not pay down principal in principal and interest payments as agreed? On October 28, 2011 Santa Barbara Bank & Trust has finally admitted to the United States Bankruptcy Court in Santa Barbara to over charging a local San Luis Obispo Buisness SBA Loan Customer. On November 9, 2011 a hearing will again be held in Santa Barbara to look at the documents provided by Santa Barbara Bank & Trust at the Banruptcy hearing! Santa Barbara Bank & Trust claims $45,171.20 in past due payments of Principal & Interest. The SBA has on October 24, 2011 provided a document showing Santa Barbara Bank & Trust to be wrong in a September 30, 2008 email to the SBA! Even Santa Barbara Bank & Trust in a August 29, 2011 SBA Form 1149 document shows the SBBT claim of $45,171.20 to be false! At this point I am looking at Credit Unions. And Yes one Day i hope to be able to re-open Oceano Nursery! Kristen Christian is a very neat name. I wish I had been that creative back in my baby-naming days. What these people don’t seem to understand is that, if everyone takes their money and puts it in a small bank or credit union, then they will become the big banks. You should do whatever makes sense to you with your own money, not what a “movement” tells you to do. If you don’t then you’re making a big mistake. Movements are important to allow people to bundle their energy into something significant. The arab uprising, Prague Spring-lots of progress, in fact the only real progress of civilization, is from ‘movements’ such as OccupyWallStreet that is sweeping the world in its popularity. That movement, of which this one is a subset, expresses the outrage of the mass of 99% people it ‘sings’ to. Thank the great spirit for movements. And if the smaller banks scr@w over their customers then people should move from them as well. But there’s nothing like supporting local fair businesses. I’d rather a local bank become more prosperous then BofA or Wells Fargo any day. Moving money from a big FOR PROFIT bank to a small community based NON PROFIT credit union is bad because they might grow big enough to compete with the big bad wall street banks? I think Not! Would taxpayer trust the big bank marketing gurus more? Would he believe in the wisdom of deregulating them? Would he believe that 30-to-1 leveraging ratio enacted by the FED is sound fiscal policy? We’ve been subjected to the machinations of a deliberate movement to transfer economic power to an increasingly small number of institutions and individuals for the last 40 years. Try Google, instead wasting our time asking others to do your research for you. I am sooo tired of questions that are EASILY answerable; > select > right click > search. Yeah, a little silly. So what? If she is a member the amount her CU would get is not huge. In any event I believe she is a sincere activist, something we need much more of. My dad used to say that there are no dumb questions, this is proof that he was wrong. Who’s the dummy here? I asked if she OR if any of her family has an affiliation. Good attention to detail, y’all – you all flamed me and only answered HALF the question. Well done! My point was simple – does she have a vested interest in seeing credit unions increase revenues. The argument that credit unions benefit the community more than the ‘big banks’ is ludicrous. The CU’s don’t pay into the tax base like the big guys do. Banking is one of the most heavily regulated industries in the USA, mostly as a result of bad actions on the part of CREDIT UNIONS back in the early 80’s. Before you flame, do YOUR homework. I agree that you didn’t deserve to get flamed. However, regarding this post, if banks are so well regulated, then why did we have to bail them out? Further more, you will find that when it comes to checking accounts and even savings your money will go farther in a credit union. The do far less nickel and diming the customers and they even pay higher interest. Banks like B of A actually try to make people incurred NSF fees. I have heard more than once that they will debit an account before applying a deposit. They claim that they always apply deposits first but I’ve heard too many people say otherwise. I know what they pulled with my credit card (they started deducting my automatic payment a day late and then increased the interest rate to over 20% from 6%) they are dirty thieves. Geez, that man should be in prison. 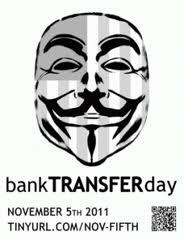 The ‘bank transfer day’ is basically symbolic for the most part. It feels good to people in that they think they are getting back at the big bank. I personally bank with a big bank and carry a large enough balance to avoid all bank fees. I haven’t paid a bank fee in years. I do, however, agree that the big banks attempting to charge a fee for debit cards was dumb – there is just no other way to say it. Since there is no free lunch, the credit unions will get their pound of flesh somehow. So most likely your big bank got a taxpayer bailout, and its CEO got another big bonus for doing a shi77y job, and all you got was a piddly squat interest rate. Congratulations, it looks like you missed the whole point. I’m not sure I understand the “movement” element of doing something smart with your money. I DO understand storing your money in a place where it makes the most sense (either from lower fees, or more convenience, or whatetever). There’s a disconnect when comparing BofA to a credit union. BofA is owned by, and responsible to, the people who hold shares of its stock. What it does as a company is maximize its value to those shareholders. Checking account holders are a necessary evil in its mission to create value for its shareholders. Credit Unions, I believe, are owned by, and managed for the benefit of, their “members.” Said members are the checking account holders and other bank-like customers. It stands to reason, then that a CU is in business to please a different master than is a bank. Banks were only ever nice to you, the checking account holder, as a business practice. CUs are nice to you because in addition to your checking account, you are their owner. I beg to differ. Bank of America is owned by, and should be responsible to, the American tax payer. If our GOVERNMENT had not bailed out B of A, et al, with my tax dollars there would be no share holders and no B of A and our country would be better off for it. It is long past time for the hammer to fall on these corrupt banks and the corrupt politicians that they own. I don’t know much about the bailout, not do I empathize with “too big to fail.” However, blaming the banks for taking free money is ridiculous. Who we ought to be pissed at is the government, who is misspending our money. For us to bail out that bank and then have that bank scr@w the same people that bailed them out is the banks fault, that is not how you thank the people that saved their @ss. Of course the govt. shouldn’t have bailed them out in the first place but this just proves that these giant corps don’t care about people, not even their own customers. It is our duty as American citizens to insure that the bailed out “Too big to fail” banks do fail. It is high time we show those Bozos in Washington and corporate America who is actually running this country (or suppose to be). Credit Unions don’t pay federal taxes because they are non profits. Instead they give the money back to their customers rather than nickel and dime us for the use of OUR MONEY. B of A needs to CRASH & BURN. Agreed. We just finished closing out all of our business with B of A. They developed a habit of suddenly charging us for our formerly free checking account as well as for savings accounts! We would go in and they would apologize and reverse the charges and then several months later they would do it again. This happened several times. I grew weary of this and several other onerous actions and fees on their part, so I began 6-months ago to close out our B of A home mortgage and home equity line of credit loans and to transfer all of our accounts and bill-pay info to the local credit union. Now the process is complete and BofA can pound sand. I love it when I hear stories of how people don’t let these fat cats take advantage them. It’s amazing how many people won’t bother doing anything about issues such as yours, good job. Gosh Cindy, we are agreeing too much these days, we need to mix it up. Now if I could just get you to see the light regarding school vouchers ;-) …. I transferred to a credit union several years ago when my bank was bought out by a larger bank. They promised that very few changes would be made . . . I actually feel sorry for the local employees of my former bank, they were good people, nearly friends. It must be difficult to watch customers, who’ve been around for years, take their business elsewhere. However, I agree that we need to stop supporting businesses that cause so much harm. Mr Brown is correct that big 100% for profit,huge bonus paying to executives,charge members for everything banks invest more money into local economies than Credit unions do, but then so did Kelly Gearheart and Co.